Things come and go, and things change in the world. That's just the way things are. I'm not one who really likes change but I think this change is welcomed. It all started about a month ago. ArtFire, who I've been with for a long time, has decided to make some business changes. They decided to put ads on product listings. It's not just one ad or two small ads it's a bombardment of ads. Ads at the bottom of the pictures and ads just below the shop categories make it hard to tell if the links are for my product or someone else. This is their business and it's their decision to make. They feel they need the income revenue from the ads. It's a decision I don't like. Personally I don't like having ads all over product pages that I am looking at. I don't like feeling bombarded by them and I do not like the placement of the ads. This and more has lead me to step away from ArtFire. March 31 will by my final day there and I have to say I don't think it's going to be a bad thing. I have moved on to, hopefully, bigger and better things. I opened a Zibbet shop that will now house supplies. The tons of supplies I have been sitting on for some reason or another will now be making there way into that shop. There will be beads, toggles, charms, book binding supplies and more. It's going to take me a bit to get everything in there but I'm determined to do it. So what's going to happen to everything that's in my ArtFire store...Well, that's getting moved to my Etsy shop. This will become my main shop where all my goodies can be found. New photo's will be taken of some older products from when my photographing skills were severely lacking. I'm hoping to expand upon things there in the future as well. Keeping my fingers crossed that when they change things around there they will be gracious enough to give us a few more shop sections. I am doing my best right now to try to make things as easy as possible for everyone to find and once the shop gets really full I will add some special links to help sort my products in my announcement there. I'm really excited about how this and have a really good feeling about it all. So for now I'll leave you with a new product. An altered composition notebook. All signs of it being a composition notebook have been erased. It is completely covered outside with a crinkled blue paper and a black velvet paper on the spine. The interiors of the covers have a decorative light blue paper with white marks covering them up. 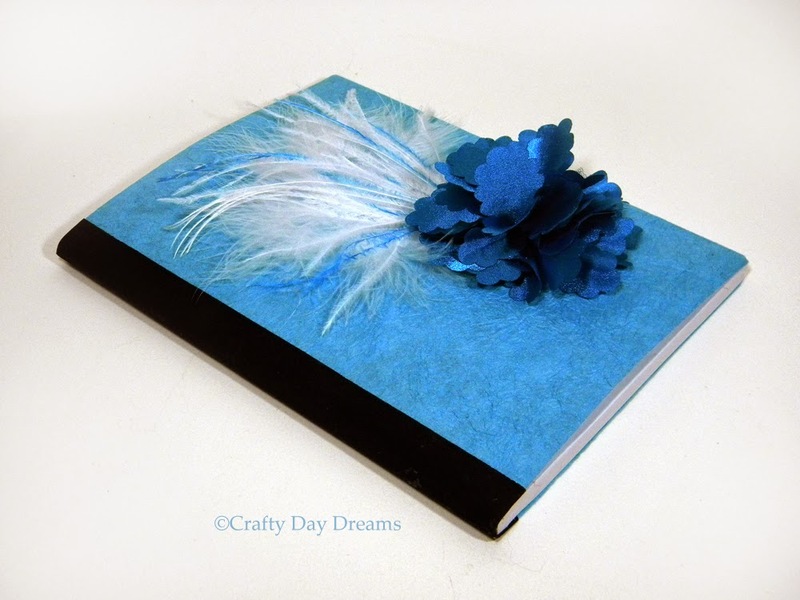 On the front cover are a few fabric flowers with some white and blue feathers. All this leaves you with beautiful notebook with lined pages inside to write whatever you'd like. I figured I share with you some embellishment making for my next mixed media canvas I'm going to be working on. I have some laser cut wood pieces from Michael's, a chandelier and a chair. I also have a Tattered Angels frame that I want to turn into a mirror. I start off by gessoing everything with a white gesso. Then I paint on some Liquitex titan white paint to brighten it up. After that I paint on some Liquitex black acrylic paint to the chandelier where the metal look will and the piece for the mirror. Because I want to give them an aged metal look the base needs to be dark. I paint on a coat of Golden titan buff fluid acrylic on the chair to give it a softer look. Once the black base coat for the metal is dry I dry brush on some Blick acrylic silver and copper paints. I put those aside to dry. While the chandelier and the mirror are drying I decide to work more on the chair. I cut out a piece of pattern paper for the cushion, making sure there are tabs so that I can make it pop out. At Michael's I found this pink ruffle ribbon that I want to use for the ruffle on the chair. To age the ribbon I use some Tim Holtz walnut distress stain and lots of water. This dulls down the pink so it's not so vibrant and new looking. I also brushed a little of the stain on the chair to give it a little bit of a worn look. Going back to the chandelier I wanted to make it look like the strands of beads are pearls and the hanging parts are pink crystals so I grabbed my Pebeo 3D pink crystal paint and some white liquid pearls. Carefully I apply a dot of liquid pearls to each of the round sections of the strands and the 3d paint to where the crystals would be. Everything dried over night and I assembled the chair eventually adding some liquid pearl trim where the paper and the fabric meet to give it a more finished look. I'm not quite sure if I'm happy with the metal chandelier or mirror frame. We'll just have to wait and see what I decided when I put the canvas together. It's been so long since I've posted. It's just been crazy around here between the conventions, followed by the holidays, and then the crazy winter we've been having. The kids being home from school for what seems like forever due to snow days has not helped out the craziness. It feels so good to be able to sit and write for few. 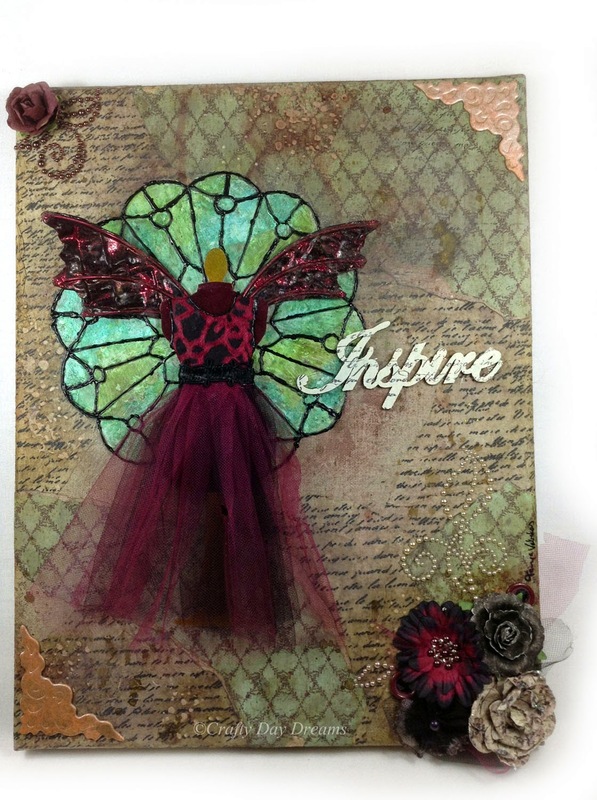 My latest completed project is a mixed media canvas titled "Inspire." I got inspired to do this piece from a sort of kit I picked up at my local scrapbook shops tag sale. The kit contained a lot of sewing items including a smaller version of the dress from that appears on the canvas. The dress form really got me thinking about an altered Barbie doll I had planned on making but never got very far with. I figured I'd take what I had planned for the doll, minus the face and ear details, and put it on a canvas. The fair wings I had made so long ago when first planning this doll. They are fabric backed, color wire formed and slightly pose-able when heated. I add a little matching glitter to them to give them the shine I wanted. The dress that you see is pretty close to the dress I had planed for the doll as well. It is made from all the fabric I had original picked up to use. The only difference is that the black outline on the top is a 3 dimensional paint from Pebeo and not trim. The canvas is a brown linen canvas from Michael's that I applied clear gesso to and then layered on some Recollections Signature printed tissue paper and Prima Marketing paper Madeline Collection "Beautima" #842383. I went ahead and grabbed my modeling paste and my Ronda Palazzari Designs "Texturized" stencil and added some texture. Once the paste dried I sprayed on some Plain Jane Baseboard "Gravel" mist and Tattered Angels Glimmer Mists in "Latte" and "Cork." I made the stain glass looking window from a dollie that was a kit I picked up. I cut the center of the dollie out and sprayed it with some Heidi Swapp Color Shine Sprays in teal and chartreuse. Then I drew on the design in the black Pebeo 3 dimensional paint. Finally I glued on all the embellishments which included Prima Marketing flowers and pearls, Tattered Angels chips, wood word Inspire, the dollie and the dress. Viola finished canvas.